Although premium products like AlleyOOP offer UV protection, try to store the trampoline in an area that’s at least partially shaded.However, be sure to avoid placing the equipment beneath trees that could damage the trampoline or cause injury to jumpers. To ensure that the trampoline stays safe and fun to use, give it a quick inspection at regular intervals. Once a month is a good schedule to adhere to, but every other month works well, too. When inspecting the equipment, keep an eye out for damaged springs, an asymmetrical frame, or sagging of the mat. These are indications that the trampoline should be repaired as soon as possible. If you’re not sure what to look for, don’t hesitate to get in touch with a professional to help you identify potential safety hazards. If you’re planning to limit your kids’ trampoline time during the winter months, make it a priority to properly store the equipment. Like most other products, trampolines can start to deteriorate if left outdoors to withstand the elements. 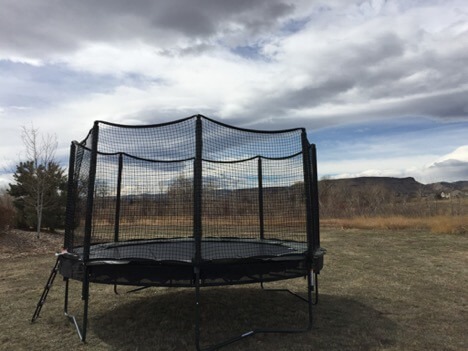 When you’re preparing for snow or other inclement weather, be sure to invest in a trampoline cover. To prepare for a longer break, consider removing the mat and springs to store indoors and out of the cold. Planning to use the trampoline all year long? AlleyOOP trampolines are designed to go the distance, so your family can enjoy jumping throughout the seasons– just be mindful of maintenance.Avoid letting snow or leaves accumulate on the mat, and anchor the frame to resist high winds. A high-quality trampoline can be a great investment to encourage physical fitness and family bonding. If you’d like to add an AlleyOOP trampoline to your yard, get in touch with our team at Backyard Dreams. We offer three of the most popular AlleyOOP models, or we can work with you to install an in-ground option. To learn more about the delivery and installation process in Colorado and the surrounding states, give us a call or fill out our inquiry form online.